This top quality universal wireless keyboard is Brand- New... If your keyboard has died or has sticking keys, Now is the time to replace it at this fantastic low price! 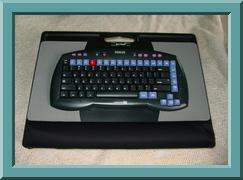 Please Note: There is a Light-Gray colored WebTV keyboard being sold by some dealers, retailing for as little as $10. We were once given the 'opportunity' to buy them in bulk for 50 cents each and we declined. We're told that many who buy these are unhappy with their quality and performance. If you are considering buying one of these Gray Keyboards, may we suggest you ask for opinions in the WebTV Discuss groups before buying one... Rather than take OUR word for it. This is the SAME Model Number (RT7W5XTW) as the RCA Keyboard shown above. They differ only in key colors, and brand logo. This top quality universal wireless keyboard is Brand- New... This is the same hard-to-find unit sold in stores for $49.95 - $54.95. Works With All WebTV Brands And Models! 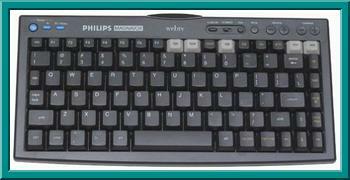 Top quality PHILIPS Universal Wireless Keyboard. Handy Glow-In-The-Dark feature on several "shortcut" keys. If your keyboard has died or has sticking or worn keys... replace it now at this low price! This is the same hard-to-find unit sold in stores for $49.95 - $54.95. Refurbished to NEW by Philips... Just $19.95! Sony L-a-r-g-e universal wireless keyboard. This popular, hard to find Sony KI-W250 WebTV Wireless Keyboard features a typing surface that is the same size as a computer keyboard. If you are serious about your WebTV, now is the time to replace your standard "mini" keyboard with this LARGER model that is SO much easier to see and use! PHILIPS L-a-r-g-e Universal Wireless Keyboard. This wildly popular, hard to find Philips MWK350BK WebTV Wireless Keyboard features a typing surface that is the same size as a computer keyboard. If you are serious about your WebTV, now is the time to replace your standard "mini" keyboard with this LARGER model that is SO much easier to see and use! 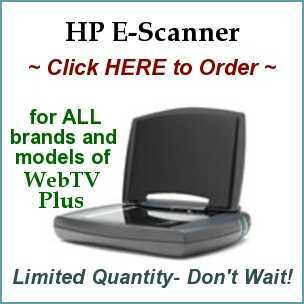 ALL BRANDS of WebTV PLUS Units. Also Sony Classic W150, Microsoft Dish 7100, 7200 and Ecostar 500. P/M MAT960 or Sony W-100 Classic. Will operate ALL Philips - Philips/Magnoavox WebTV Plus Terminals. This unit is not compatible with Philips Classic Terminals. This unit will operate ALL SONY WebTV Classic And PLUS Terminals. Will operate nearly all TV sets with remote control capability. 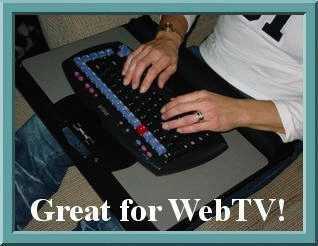 DELUXE Top Quality Lap-Desk gives you comfortable support for your WebTV Keyboard. Also allows you to relax in a recliner with your keyboard in your lap. Tapered, LAP-CONFORMING "Bean Bag" pillow base provides an adjustable angle for lining up your keyboard with your WebTV Terminal. 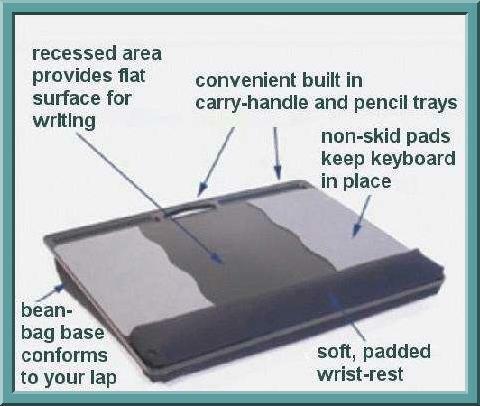 Built-In Padded WRIST REST is ergonomically designed to increase your comfort and decrease fatigue. Two NON-SKID pads keep keyboard in place. Rigid Molded Top includes pencil trays, a center writing area and a carry-handle. Durable Canvas wrist rest and bean bag for years of service. When you buy a "NEW" item you have FAITH in its quality because it has come to you from The Factory. You can have this same FAITH in a REFURBISHED item... It ALSO comes to you from The Factory. So... What does it mean? Why back to The Factory? Some stores return merchandise to The Factory that customers have returned to them... Even if the item was never opened. Factories also get merchandise returned to them if a part or instructions are missing. In some cases products are returned due to a problem that appears during the warranty period. As stated above each item is tested, and if necessary restored to Brand-New. Most "NEW" products offer a 1 year warranty- which you'll usually never need. Most refurbished items offer a 3 Month Warranty... NOT beacuse they are inferior, or will not LAST AS LONG... but simply because The Factory has already invested more money in the product as a result of having to restore it so they limit the warranty to limit the OVERALL CHANCE that they'll spend even more as the result of a longer warranty. Famous Brands Have Their Reputations To Uphold... NOTHING Leaves Their Factories Unless They Are 100% Certain Their Customer Will Be Happy!